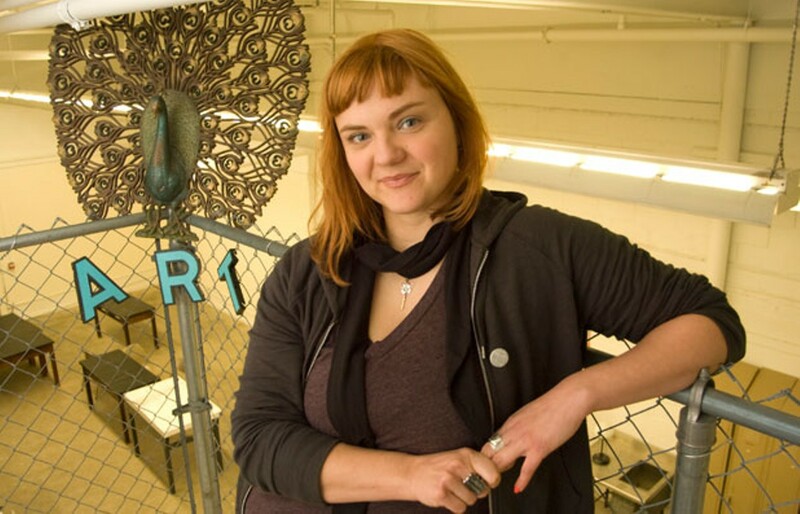 Christy Mitchell looks out over the chain-link fence that encloses the loft atop her studio in the Backspace, part of Burlington’s Soda Plant, and describes her vision for the place. Over there she’ll have seven lab tables reclaimed from Burlington high school science classrooms, which can be rolled away on caster wheels to make room for events. The wall by the door, covered in blackboard paint, will serve as scribble space for brainstorming and announcements. On another wall, Shelburne artist Kristen L’Espérance will paint a mural with an industrial look. With no work currently on display, the place is almost oppressively drab, buzzing under fluorescent lights. Mitchell envisions a creative lab lit by glowing beaker lamps that she’ll design. It takes an artist to see potential in all that concrete. The 29-year-old metal artist is the “creative facilitator” of the S.P.A.C.E. Gallery, which several months ago expanded to include the Backspace — located, logically, at the back of S.P.A.C.E. A graduate of the Savannah College of Art and Design, Mitchell moved to Burlington after finishing school in 2003 and began working for Conant Metal & Light, also housed in the Soda Plant. In 2008, when Conant sold the part of its business that occupied the warehouse, Mitchell already had an idea for the space. A former member of various Burlington artist collectives, she was working alone in a studio when the Conant sale happened. Mitchell missed being part of an artistic community, but she knew from experience how difficult it is to sustain a gallery on art sales alone. So her plan for the S.P.A.C.E. Gallery — an acronym for Soda Plant Artist Collective Environment — was to pay for the place entirely with rent from artist studios. “When I opened this last year, I said within two years I want to open another space,” says Mitchell. When the warehouse that would become the Backspace became available, she says, it felt a little too soon. “But I was watching that space, and I just couldn’t not take it,” she recalls deciding. S.P.A.C.E. currently houses studios for 12 artists, including clay master John Brickels, painter Sage Tucker-Ketcham and “strange dolls” creator Beth Robinson. The studio space has a mostly open plan, allowing visitors an easy glimpse into the nitty-gritty of the artists’ work. On a recent afternoon, Brickels perches at a desk, scoring the clay rounds that will become mugs in the shape of robot bits and bolts. Robinson is away, but a peek into her darkened studio reveals a creepy scene: The dolls reside, wide-eyed and menacing, on various shelves and tables, lending a sinister cast to even the innocent toaster oven on the desk. The gallery walls aren’t offering any respite this month. 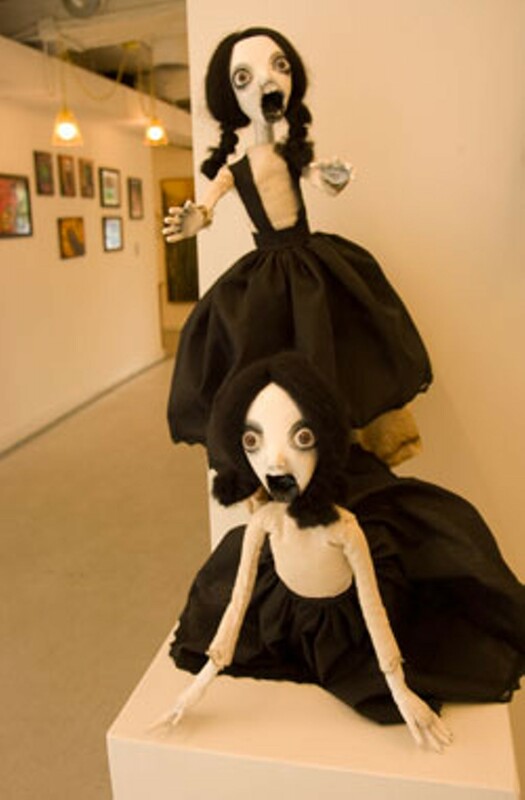 Robinson curated a Halloween-themed show called “The Art of Horror,” which showcases Lorraine Reynolds’ dark dollhouse assemblages, goth paintings by Kevin Montanaro and devilish masks by Justin Atherton, among others. The art at S.P.A.C.E. is refreshingly noncommercial. As a collective supported by studio rents, Mitchell says, it can show work without expectations that anyone will buy it. Nevertheless, most of the pieces are priced and for sale. In early November, Mitchell, Alecia Geno, Ashley Roark and Greg Mam-czak will show their work in an exhibit about repetition and reproduction called “Make Art, Repeat.” In December, Mitchell plans to curate a show of small works — nothing bigger than one foot in diameter. On the events calendar for the rest of this month are a demolition derby for remote-controlled, artist-built cars, and a murder-mystery dinner in Backspace. This isn’t the first time Mitchell has cultivated art in an empty building. For her senior project in Savannah, she worked with other artists to convert an abandoned bank into a temporary gallery. The experience has stayed with her, Mitchell says, as she builds up the S.P.A.C.E. Gallery. She’s always looking for the potential in spaces, keeping one eye trained on the next big place to grow. Right now, that’s not only the Backspace but the “garden” behind the building. Members of the youth program at ReSOURCE — formerly Recycle North — recently came by to clean up the grassy backyard. Once you’ve scrambled up a narrow path to get there, the focal point is the crumbly foundation of an old building. But Mitchell sees a potential sculpture garden, a stage on the foundation for music and plays, and a patio for exhibit receptions. It all comes down to making spaces for artists to thrive, she says.